user warning: Expression #1 of ORDER BY clause is not in SELECT list, references column 'hotkilns_live.n.created' which is not in SELECT list; this is incompatible with DISTINCT query: SELECT DISTINCT n.nid, n.vid, n.title FROM content_field_videos_features nr INNER JOIN node n ON n.vid = nr.vid AND n.status = 1 INNER JOIN node_access na ON na.nid = n.nid WHERE (na.grant_view >= 1 AND ((na.gid = 0 AND na.realm = 'all') OR (na.gid = 0 AND na.realm = 'content_access_author') OR (na.gid = 1 AND na.realm = 'content_access_rid'))) AND ( nr.field_videos_features_nid = 231 )ORDER BY n.created DESC in /home/hotkilns/public_html/sites/all/modules/nodereferrer/nodereferrer.module on line 428. Many kilns have all elements controlled as one zone. Often the elements are graded in power output from top to bottom to adjust for temperature uniformity due to greater heat losses at the top and bottom. With unzoned kilns there is no way to adjust for varying load conditions. Zone control does this automatically. We do use element grading on some kilns like the School-Master kilns - but we believe zone control gives the user more control over the firing of the kiln and will provide a more even firing, especially in the long run. As the elements age and change in power output (and they will do that at varying rates because of their different designs) the built in adjustment will change. In most L&L sectional kilns (Easy-Fire, Jupiter,JH, DaVinci) each section is a separate zone controlled by individual contactors. L&L Front-Loading kilns are also zoned from top to bottom. The DynaTrol features Dynamic Zone Control. It is like having three controls in one. The DynaTrol separately measures temperatures in the bottom, middle and top of the kiln and automatically adjusts the heat output of three separate heating zones even as the kiln is heating up. 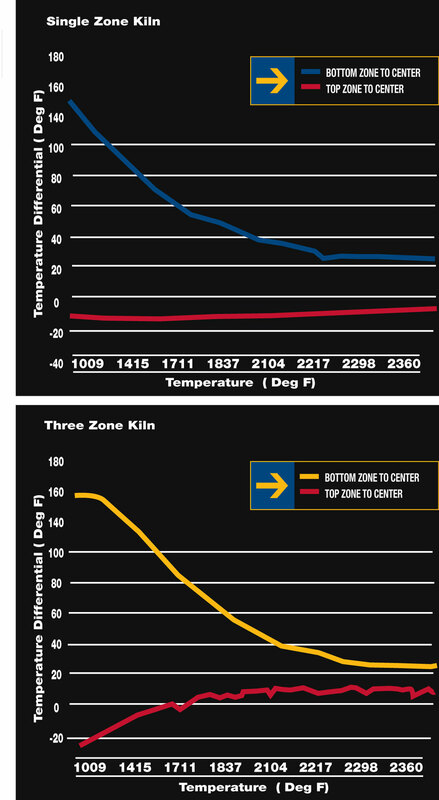 Kiln temperatures are automatically evened out to within 1/2 cone or better top to bottom. There is no manual intervention with input switches. There are separate thermocouples (heat sensors) and contactors (power controls) for each of the three zones. The DynaTrol with the 700 Series board (since Jan 2006) includes improved LAG function for Zone Control. The ramp rate now determines the LAG. If one section lags behind the traveling set point by more than one LAG value then the rate of rise of the traveling set point is slowed as shown in the table. This allows the tightness of control to be balanced against speed by setting your ramp rate. L&L has many years of real-life experience with zone control. We have built millions of dollars worth of high-tech multi-zone furnaces to heat treat superconductors, process optical glass and make aerospace parts. Several 200 cubic foot kilns we built have 27 zones and are accurate to within plus or minus 2°C. 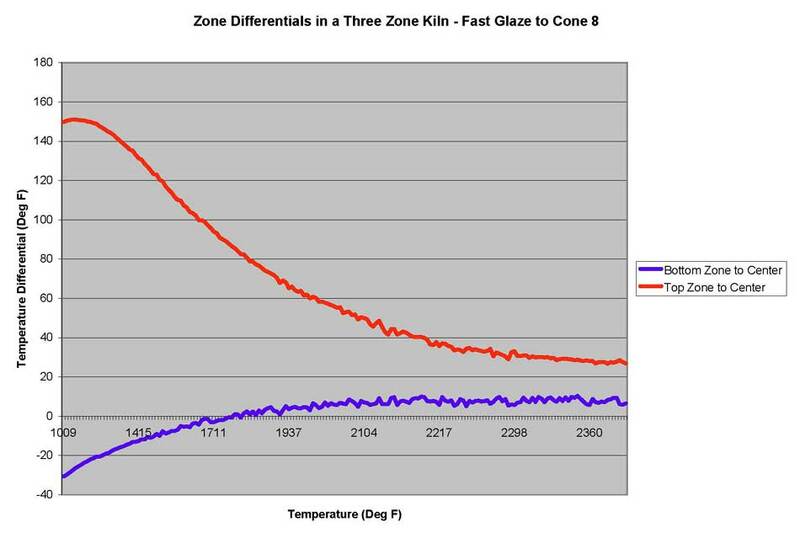 One of our multi-zone furnaces was used to calibrate all the furnaces at Corning Inc. - it was so accurate they had to measure it with chromatic glass, which is far more accurate than any thermocouple available.